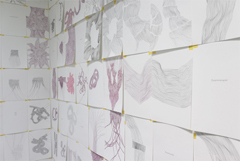 The exhibition revolves around the installation alles nichts besonders (everything nothing special), comprising several hundred drawings that fill the walls in the entrance area. Also on view are large-format drawings executed this year. Evelina Cajacob’s (*1961 Sumvigt, Switzerland) drawings call to mind loops, waves, and twisted knots. Forms made up of filigree lines seem to twist endlessly into themselves and each other. Delicate hatching creates floral structures or transforms the shapes into biomorphic, almost organic-seeming entities that meander across the paper. The 434 drawings on display were produced over several months in a concentrated process when Cajacob had a fellowship at a Vienna studio last year. The artist kept churning out drawings, gradually covering the studio’s walls. 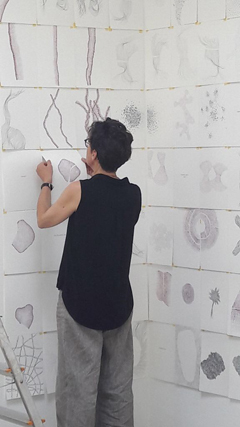 She decided in the process to lay claim to selected words and incorporate them into the growing installation. This is the first time in her career that she is playing with language in the midst of her drawings. The words she has chosen raise questions, yet seem as light and ethereal as the drawings themselves. What lies hidden in these loops and waves, twists and turns? Is there an order and a plan here, or is the immediacy and impulsiveness we feel merely the point of departure for “nothing special”?